In Technical Terms: We changed the communication between our signal processing and wifi chips to use a binary packet protocol. This allows us to remotely update our signal processing chip set and cost down by removing a flash part from the board. In Layman’s Terms: With these changes we are now able to send updates directly to our devices when they need them to ensure they are working properly and to improve the accuracy and the user experience – over time. During this process, we found out we needed a minor board revision. We made this change and have new boards being manufactured as we write this. The new boards will be arriving the 1st week in February. We’re currently doing tests with existing boards that we’ve retrofit with jumper wires (see image below). Board used for testing purposes only. Devices that we ship to you will not have jumper-wires or re-work like this. Once we receive these new boards and test them to ensure that the revision was successful we’ll be ready to do a large run and begin fulfilling orders. Now it’s Time to Calibrate and Box Them Up! Please know that, while we are sharing this exciting news today, we’re still just getting started and we’re going to be doing a few more small runs before manufacturing the larger run that will allow us to fulfill all our backers and others who pre-ordered through our website. Hopefully this gives you an idea of how close we really are getting! We’re excited to share that FLUID was named one of Utilities Tech Outlook Magazine’s Top 10 Smart Water Metering Solutions Providers for 2018. You can find the Top 10 List here. 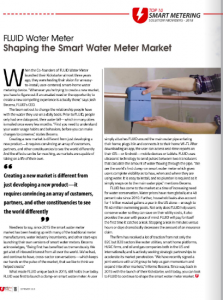 They also did a nice write up on FLUID entitled Shaping the Smart Water Meter Market. We’ve received our first set of boards back from our most recent manufacturing run. This week we’re going to bring all of these boards up so we can take stock on what our yield was with our new US based manufacturer. We’ll diagnose if there were any issues and rectify them for our next run of 50. Once we’ve established yield and addressed any problems that arise, then we’ll begin assembly with all the boards that checked out. We’re slightly behind on the mechanical (enclosure/plastics) because we made the decision to do a small revision so that the clamping mechanism will be able to fit both a 3/4″ as well as a 1″ pipe. This way we don’t need two separate sets of steel injection moulding tools when we’re ready to release our next size. We hope to have this revision finalized by the end of the week and we’ll send the designs to the tool manufacturer. Our hope is that we’ll have “first-shots” from the tool manufacturer in approximately 4 weeks. Feels good to be getting closer to fulfillment. In our last update we stated that we’d made the decision to manufacture smaller batches of 50 meters while implementing a series of manufacturing tests that can accompany each successive batch so that we can increase our yield. At the time of our previous post, the off-shore manufacturer had given us an 8-week lead time. However, they hadn’t taken into consideration the lead-times for some of the parts they needed to source. In the end we made the decision to shift manufacturing back to the USA and we are currently working with a highly reputable printed circuit board manufacturer that is ISO certified and veteran owned. They have been able to source all the parts we need and are currently getting the PCBs finished. Once this is completed, they’ll populate the PCBs with all the parts. They’re estimating that they’ll have these first 50 sets of boards done by late August. We’re also getting injection molding tools built. We’re trying to time everything so that we’ll have the boards and the “first-shots” from the injection molds in hand for assembly and distribution by September. So, we’re still making progress and feel closer now than ever. Thanks for accompanying us on this journey. New Company Will Accelerate Market Adoption of a Series of Advanced Water Measurement, Analytics and Leak Technologies the World Has Never Seen. Minneapolis, Minnesota. June 4, 2018 – FLUID Labs, Inc. is announcing the formation of FLUID Services, Ltd. (FLUID Services), a new partnership with Daisymill Technologies. FLUID Services will be responsible for the global commercialization of the entire portfolio of advanced water technologies being developed by both companies. FLUID Labs core technology, the world’s first clamp-on smart water meter, is set for roll-out before the end of the year. Daisymill Technologies works extensively with Manchester Metropolitan University (MMU), and the British Government to fund PhD students to develop disruptive technologies and turn them into commercially viable products. MMU’s Knowledge Transfer Partnership initiative is impacting their supporting businesses by an average of £1 million per annum after 3 years. “When it comes to engineering, MMU is the MIT of the UK. So, this partnership allows us to gain access to top-notch talent, pair FLUID with Daisymill’s advanced water technologies and leverage the experience and depth of the team that Daisymill brings to the table.” says, Josh Becerra, founder & CEO of FLUID Labs. Daisymill Technologies is a consortium of UK water industry experts, who have been at the forefront of innovation in recent years. Daisymill’s leadership team has worked with all the major players in the UK water industry. “We were impressed with the worldwide potential of FLUID and saw a lot of synergies with the technologies we’re developing with MMU. Within a month of our first conversation we were fitting a prototype in the home of a senior manager in one of the largest UK water supply companies.” says, Richard Coffey, Director of Daisymill Technologies. Water usage and conservation is becoming a major concern for water supply companies around the world. All of the advanced water technologies that FLUID Services will be responsible for commercializing globally will help water supply companies as well as consumers identify and prevent leaks, better understand their usage, conserve water and save money. Today we’re sharing a new timeline for when those of you who have pre-ordered or backed us on Kickstarter can anticipate receiving your FLUID meters. First, we’d like to state the obvious – we underestimated both the difficulty and time it takes to ship a product like FLUID. For our Kickstarter, we had working prototype that cost us +$900 to manufacture because it was made mostly of off the shelf parts. The process of re-engineering this into a product that can be produced for under $299 (our retail price) has plagued us since our Kickstarter ended. We tried using a threshold based time-to-digital converter (ASIC solution) that we were purchasing – but found we couldn’t achieve a good enough signal to noise ratio. We scrapped that plan and went to China to leverage existing clamp-on ultrasonic technology. After months of testing we found the Chinese meters were inconsistent and inaccurate. We scrapped the China partner plan and tried building our own again. Thankfully we had a number of break-throughs during this process and instead of using an ASIC we have achieved the proper noise to signal ration using our completely proprietary design. Now we are testing this and while we’re happy with the flow sensor itself, it’s been taking longer than we hoped to iron out all the bugs. We’ve encountered bugs in the firmware with features like WiFi setup and we’ve noticed there are some issues around long-term accuracy that we’re rectifying. We’re crunching through these issues and are making progress. We’ve given ourselves a couple of months to work these kinks out in the small pilot. Once we get to a point where we are satisfied with the performance we’ll be ready to get meters manufactured and begin shipping. Please know that we are committed to this project and are working as fast as we can. The last thing we want to do is ship a product that doesn’t work properly or becomes inaccurate over-time. An inoperable meter and bad water usage data isn’t worth anything to you or to us. Below you’ll find the new product roll-out timeline we’ve developed. Thank you for your continued patience. A number of boards ready to go!